I am pleased to enclose a copy of a publication entitled “Suggestions for Protection of Industrial Facilities” which has been prepared by this Bureau for the confidential use of officials of industrial concerns and duly constituted law enforcement agencies. It is thought that the contents of this booklet may be of assistance to you. It would be appreciated if you would execute the attached receipt and return it to me in the enclosed self-addressed franked envelope. The provisions of the Federal Espionage and Sabotage Statutes should be called to the attention of each employee. This may be accomplished by providing each employee with a copy of these Statutes or by posting them on the plant bulletin boards. It was noted during the survey that the guards you presently employ are required to perform both janitor and guard duties and it is suggested that the guards be permitted to perform guard duties exclusively. 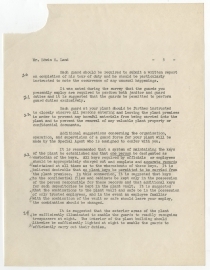 It is recommended that the door to the laboratory on the fifth floor of your plant, where confidential experiments are presently being conducted, be locked at all times so that unauthorized persons cannot gain admittance. 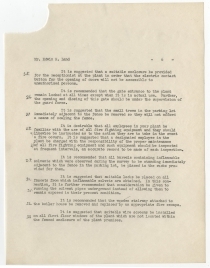 Any confidential data or memoranda or memoranda with respect to the confidential experiments being conducted in this laboratory should be maintained in the plant vault when this material is not in the possession of authorized persons. I should like to call your attention again to the pamphlet entitled “Suggestions For Protection of Industrial Facilities.” A review of this booklet, it is believed, will provide additional suggestions for improvement in the protection of your plant from foreign espionage and sabotage, and it is suggested that you refer to this pamphlet at frequent intervals as conditions in your plant change due to increased production or other reasons. 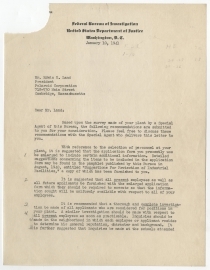 I should like to take this opportunity to assure you that you may feel free at any time to communicate either with me or the Boston Field Division of this Bureau with respect to any matters of mutual interest. In July 1916, before the United States entered the First World War, German saboteurs set off an explosion at a munitions stockpile on the artificial Black Tom Island in New York harbor. The munitions were to be supplied to Russia for use in its opposition to the Central powers. The explosion was the equivalent of an earthquake, broke thousands of windows in Manhattan, damaged the nearby Statue of Liberty, and was felt as far away as Philadelphia and Maryland. Seven people died in the attack, and hundreds were injured. As the United States tried to remain a noncombatant in the world war that raged across Europe and Asia in 1939 and 1940, the new Federal Bureau of Investigation (FBI) and its director J. Edgar Hoover worried about the potential for espionage and sabotage like that before World War I. Of special concern were the many research facilities and factories where advances in many fields were being made. 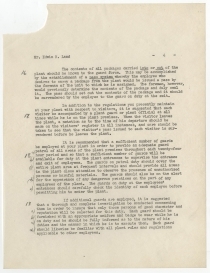 In 1938, the FBI had investigated 634 cases of espionage, compared to a previous annual average of 35 cases, because of the increased intelligence efforts of German, Japanese, and Italian agents in the United States. 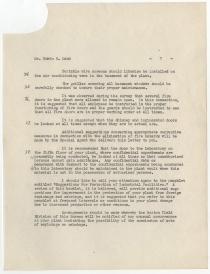 By the fall of 1939, the FBI had instituted a nationwide plant survey program. FBI agents with special training visited industrial plant managers, inspecting their sites, looking for weaknesses, and offering recommendations for protecting factories against sabotage and espionage. 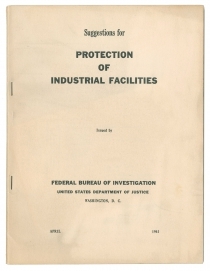 They also prepared the pamphlet Suggestions for Protection of Industrial Facilities to distribute confidentially to supervisors of industrial factories with general suggestions for protecting themselves and their work from spies and saboteurs. 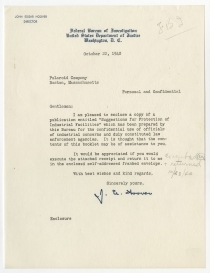 The letters offered here from FBI Director J. Edgar Hoover to the leadership of the Polaroid Company reflect that process in action. 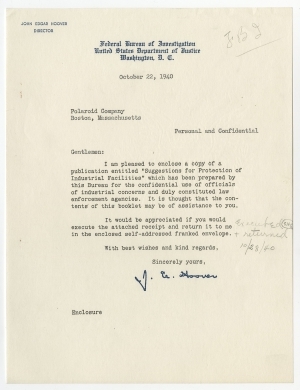 The first, in October 1940, transmits a copy of the pamphlet, and the second, less than three months later, conveys specific suggestions based on the visit of an FBI special agent. 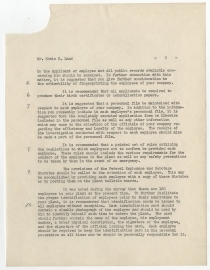 The detailed suggestions reflect Hoover’s practice of maintaining files on anyone thought to be subversive, and he recommends that the Polaroid leadership gather information on the “general reputation, character and background” of all of their employees, including data from school and other public records. Germany’s most direct effort at sabotage within the United States occurred in the summer of 1942, when two teams of four well-supplied saboteurs each landed on Long Island, New York, and near Jacksonville, Florida in mid-June. All had lived in America, and their targets were hydroelectric plants, aluminum factories, canal locks, railroads, and water works. To increase public panic and terror, they were also instructed to bomb Jewish-owned department stores and passenger railroad stations. Almost immediately, one or two of the saboteurs decided to turn themselves in to authorities and inform on the rest. One of the team leaders traveled to Washington, DC, and turned himself in to the FBI, who quickly arrested the other saboteurs in New York City and Chicago. Six of the saboteurs were executed in August 1942, and the other two were imprisoned until they were deported to Germany in 1948. Because of Land’s Jewish heritage and military research, Polaroid might have become an eventual target of German sabotage, but the complete failure of the June 1942 saboteurs discouraged further efforts. Rumors of industrial espionage and sabotage, however, remained alive throughout World War II and through the Cold War that followed. J. Edgar Hoover (1895-1972) was born in Washington, DC, and graduated from George Washington University Law School in 1916. Hired by the Justice Department in 1917, he soon became head of the Alien Enemy Bureau. In 1921, he became deputy head of the Bureau of Investigation, and in 1924, its sixth director. In 1935, the bureau was renamed the Federal Bureau of Investigation, and Hoover served as its director until his death. 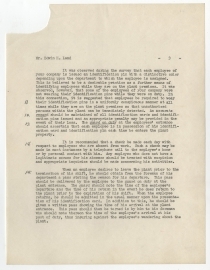 Especially effective against gangsters in the 1930s, Hoover helped to professionalize federal law enforcement with fingerprinting, handwriting analysis, and other forensic methodologies. His special agents (G-Men, short for “Government Men”) became an elite crime-fighting force. Throughout his career, Hoover was particularly concerned with subversion by both foreign and native-born agents. From the 1940s through the 1960s, the FBI conducted surveillance on thousands of Americans and foreign nationals in the United States. He was particularly concerned about the threat communism posed to the United States. Edwin H. Land (1909-1991) was born in Connecticut of Eastern European Jewish descent. After studying chemistry for a year at Harvard University, he went to New York City, where he developed inexpensive filters for polarizing light. He returned to Harvard but did not complete his degree. In 1932, he and his Harvard physics instructor began Land-Wheelwright Laboratories, which in 1937 became the Polaroid Corporation. The application of his inventions extended from sunglasses to necessary components of LCDs. During World War II, he worked on military tasks, including passively guided smart bombs and a system that revealed camouflaged enemy positions in aerial photography. He developed an instant camera in 1947 and began commercial sales in 1949. Although chief executive of the Polaroid Corporation, he was first and foremost a scientist. He resigned as chairman of Polaroid on July 27, 1982. The first letter is in near fine condition. 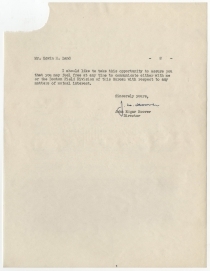 The second letter has a large area of paper loss in the upper left corner of all pages, with no loss of text.